Getting there was half the fun. 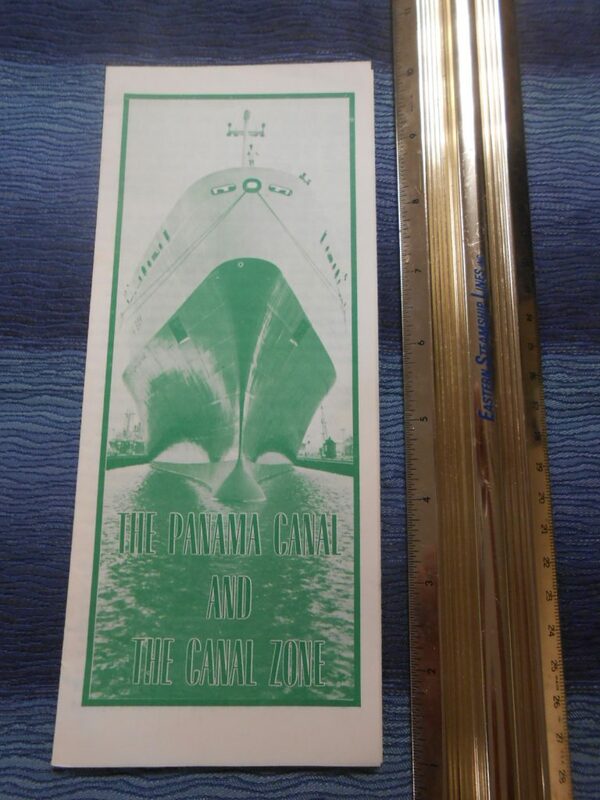 Nice flyer guide on the voyage through the canal zone. 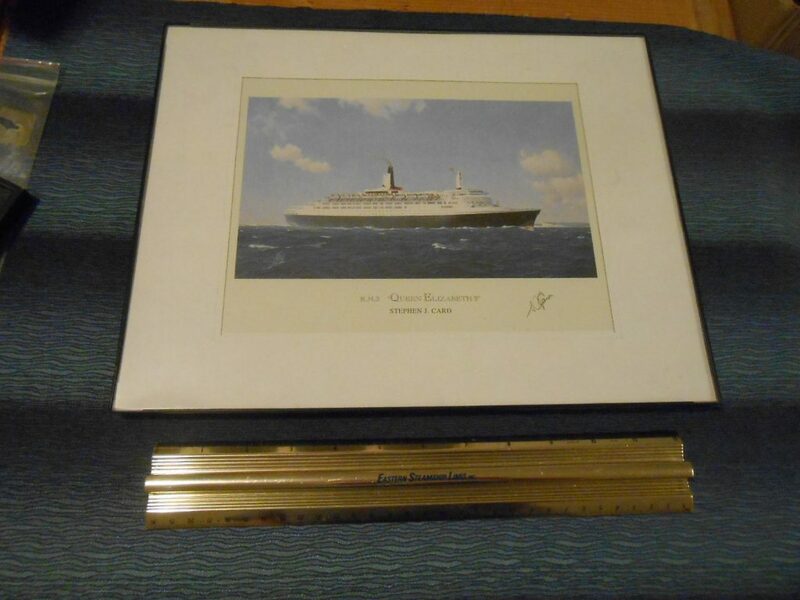 These would have been available on any cruise through the canal … this particular one has a photo on the QE2 inside and well as tankers, freighters and other craft. 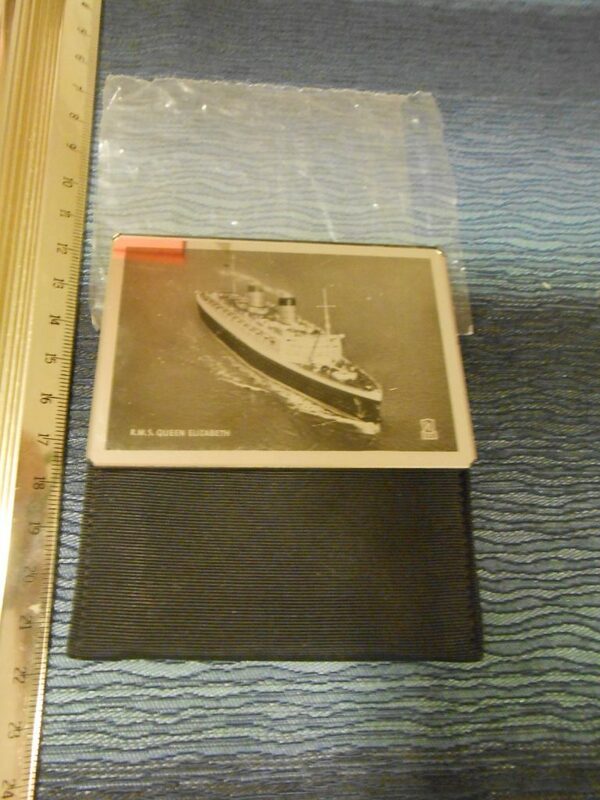 Great fabric ticket folder … looks to be the Aquitania on the cover. Line all ships prior to ww1 .. they made most of their profits on carrying steerage from the old world to the new. Excellent condition. Great reproduction poster for the Smaller A class of sisters that were built to be the slower workhorses of the fleet . Suitable for Framing! Nice reproduction mini poster of the 1905 sisters Carmania and Caronia. In order to test the efficiency of the new fangled turbine equipment, the Caronia was built with turbines and the Carmania was outfitted with traditional reciprocating machinery. Of course, Turbines won with superior performance. This poster is perfect for framing. 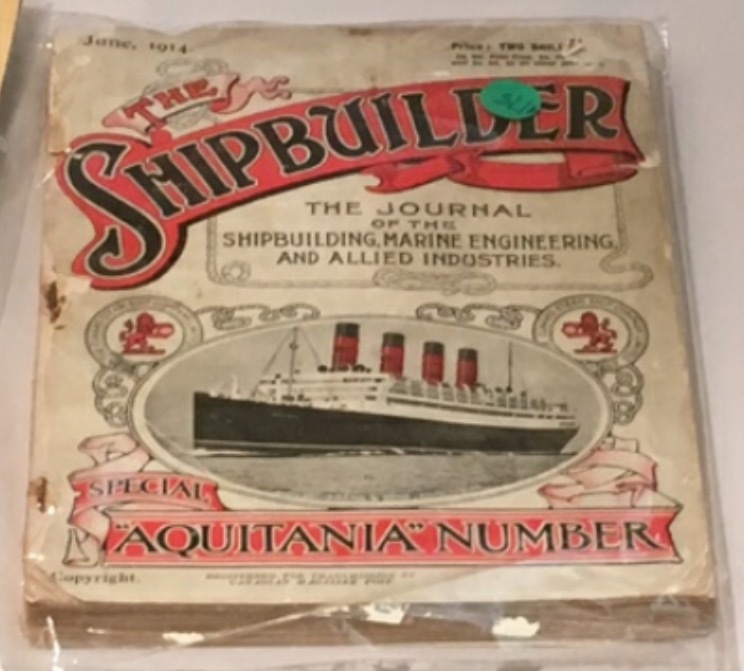 Great original copy of the Shipbuilder Magazine … this one dating from 1914 and completely dedicated to Cunard’s Aquitania. The covers and spine are a little worn but the interior pages are 100% complete and great… right down to the plans and color plates. 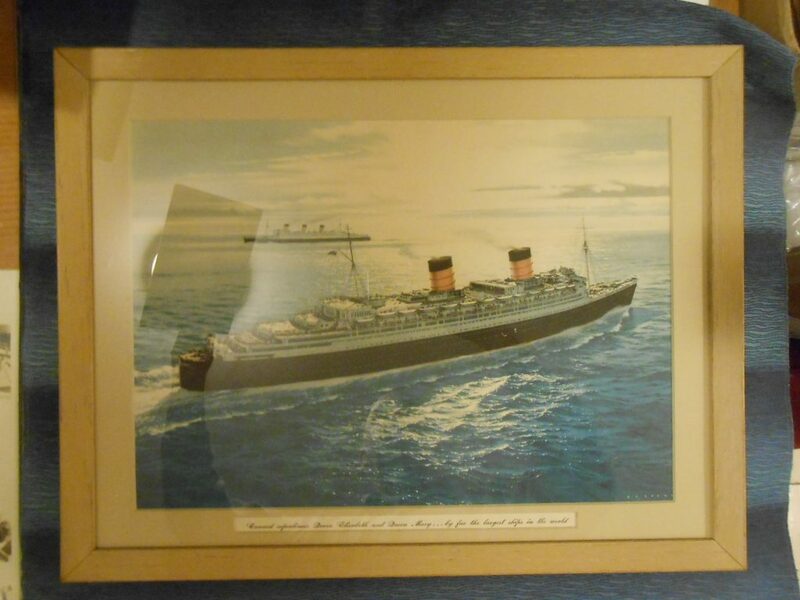 If the Aquitania is your ship … this is a must have item. Many folks have these rebound with hard covers … this could be a great candidate for that. An absolute treasure! Great little PL for the QM … not many travelers … her capacity and profits were sorely hurting by 1966. 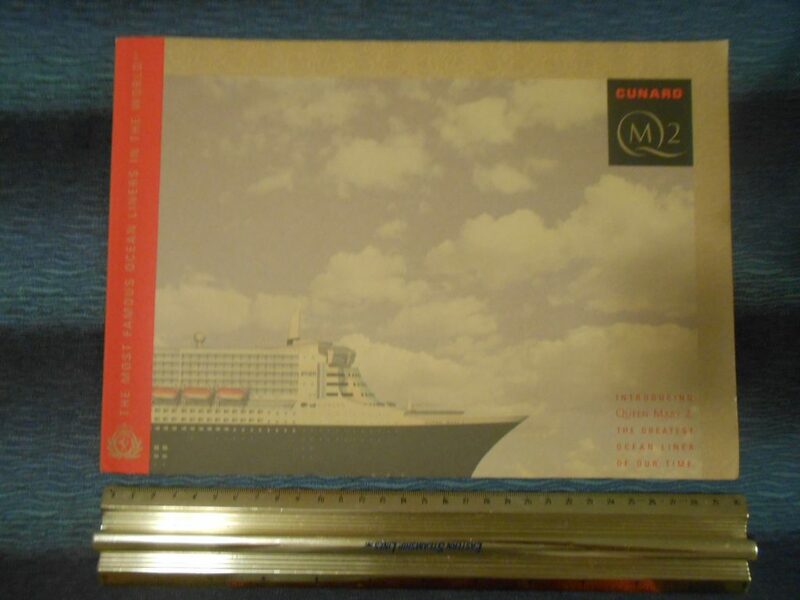 Super Nice copy of the Inaugural brochure for the QM2 … packed with all sorts of inserts, plans and info on the ship. Great condition. 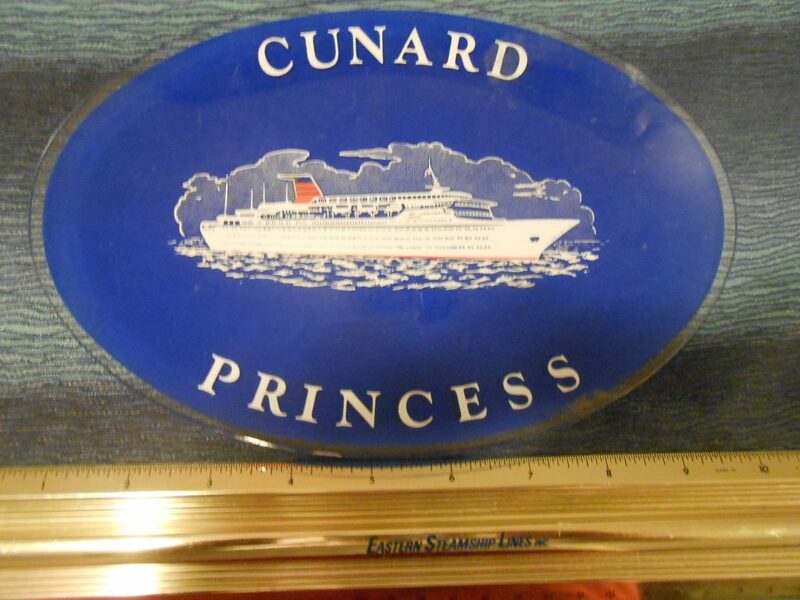 Cunard Line: Queen Elizabeth Souvenir Mirror. Probably one of the most practical souvenir gifts you could have bought onboard … were these great little mirrors. The image of the ship as she steams along is an excellent birds-eye head-on view. The little protective pouch looks to be new. Great little item. 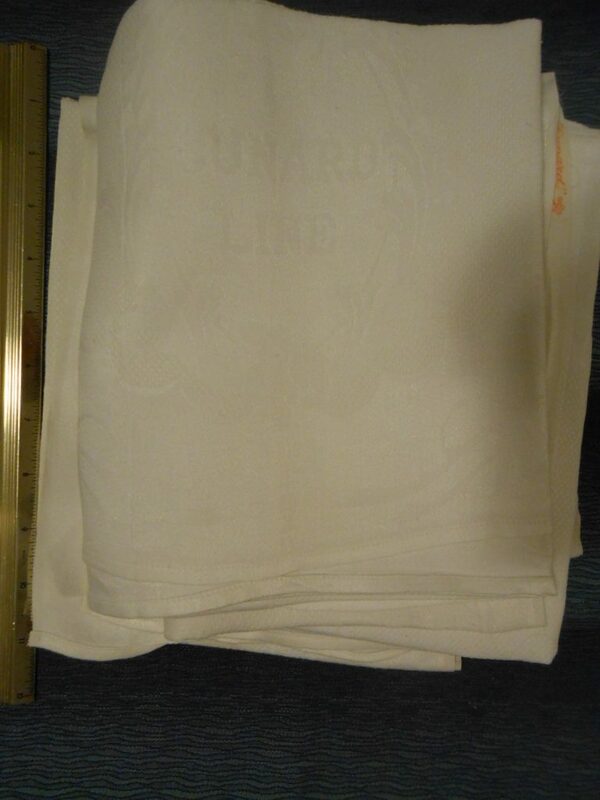 Cunard Line: Queen Mary Linen Tea towels. One of the many things that came with the ship when she reached Long Beach that would make their way into the onboard gift shops were the tens of thousands of different linen items that were used during her service life. This towel does come with spots and signs of use … but is in overall great condition. 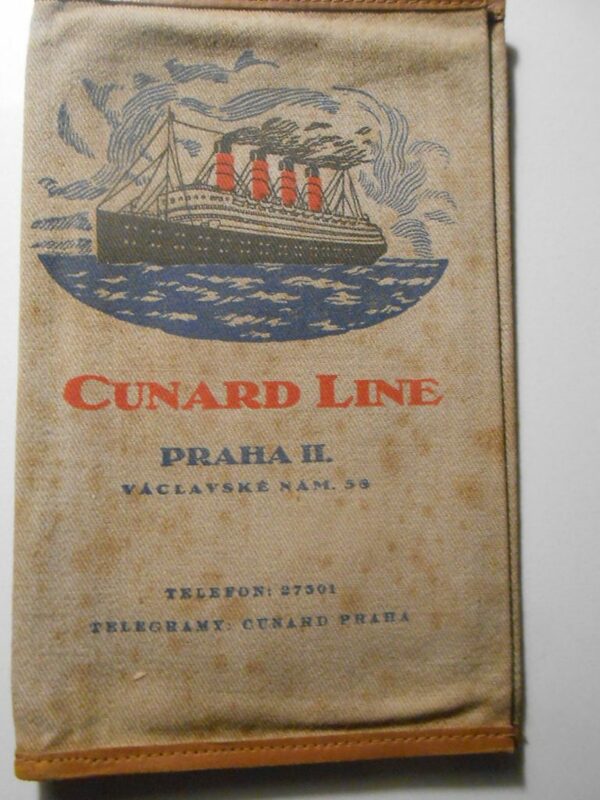 You can just see “Cunard Line” woven into the thread designs .. as well as a little Cunard tag on the side. These are large approx. 18×30. 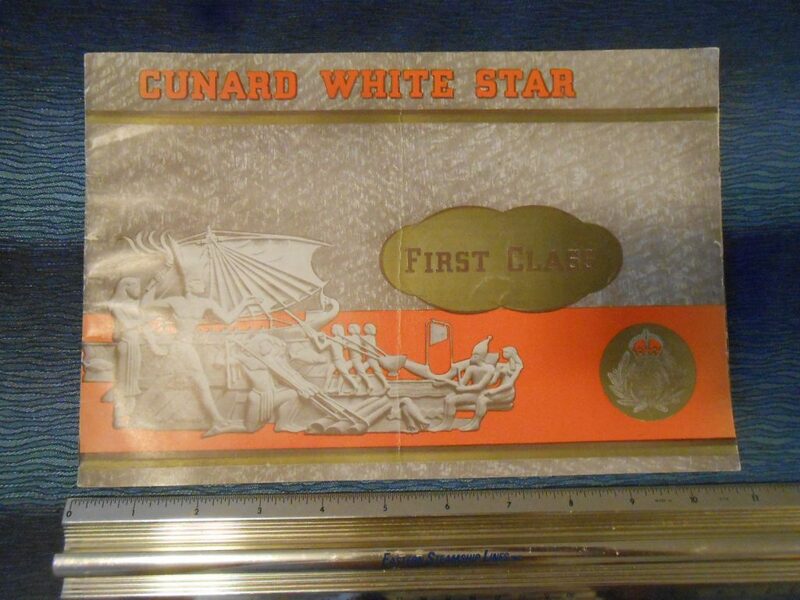 Perfect for a Cunard or QM collection. 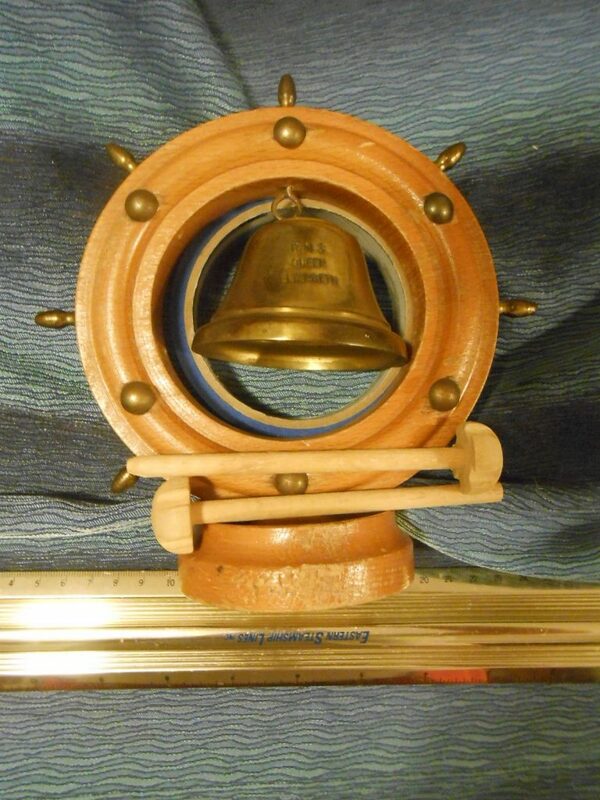 Great little light weight brass dinner bell souvenir for the Lovely Queen. This could use some polish and shine energy… but all the parts are sound and includes 2 little hammers. Brass accents. 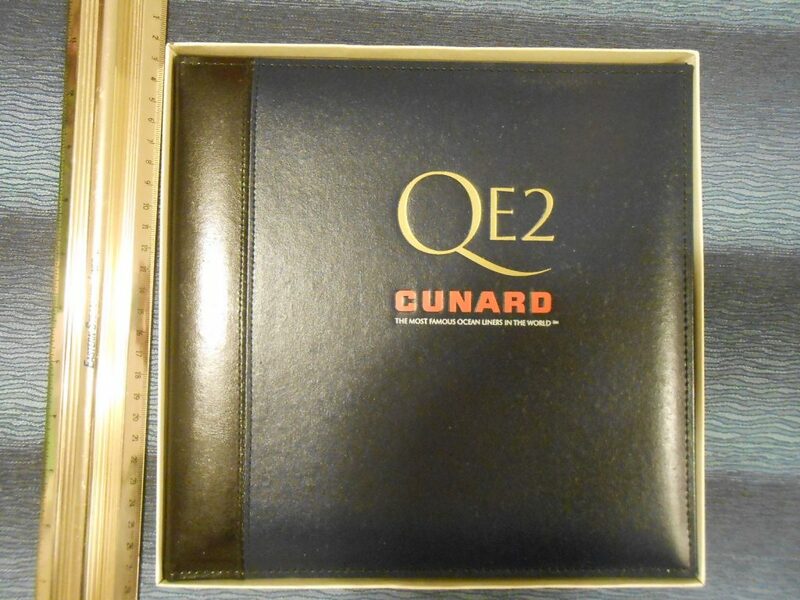 Excellent photo frame album for the QE2. Made from leather, this is NIB and in brand new condition. This will display 2 large ( approx. 5×7) photos. Excellent! Lovely QE2 printed by the renowned artist and captain Stephen Card. This comes frame in a simple black frame from its original owner. Showing the QE2 something before her mid 1980’s conversion … her funnel is still white and in it’s original configuration. 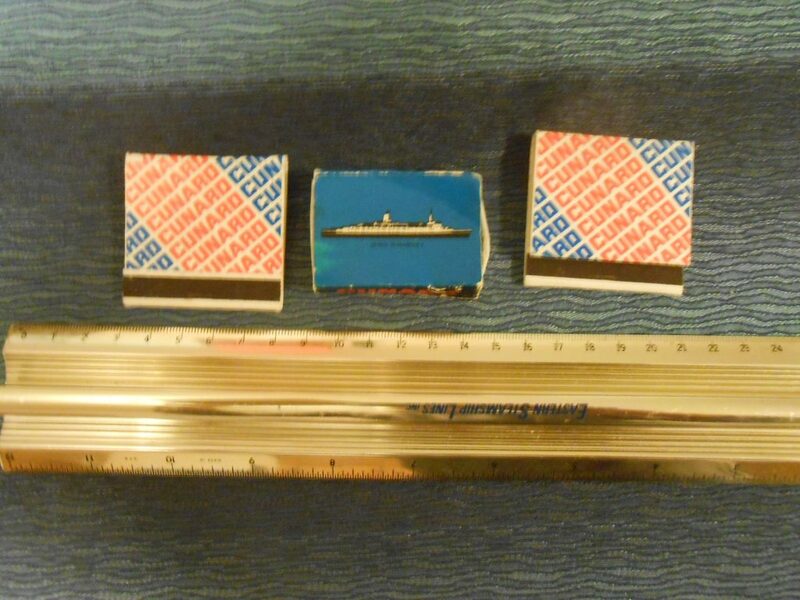 A nice part of 60/70’s Cunard match packs and a little QE2 box of wooden matches (the box is a little flattened). Good shape and still usable. 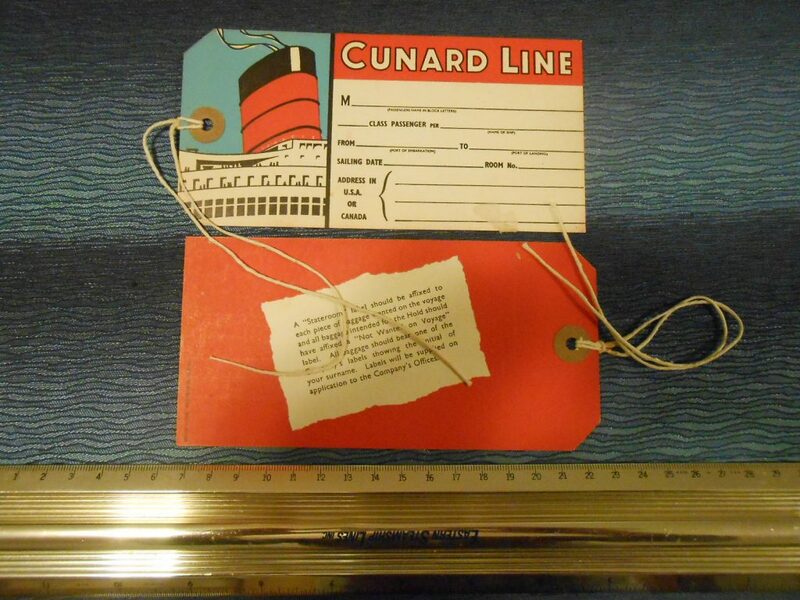 Once of my favorite Baggage Tag styles are these post war gems from the Cunard Line. In great condition. I have several and one or 2 of them have a little baggage sticker residue on them. 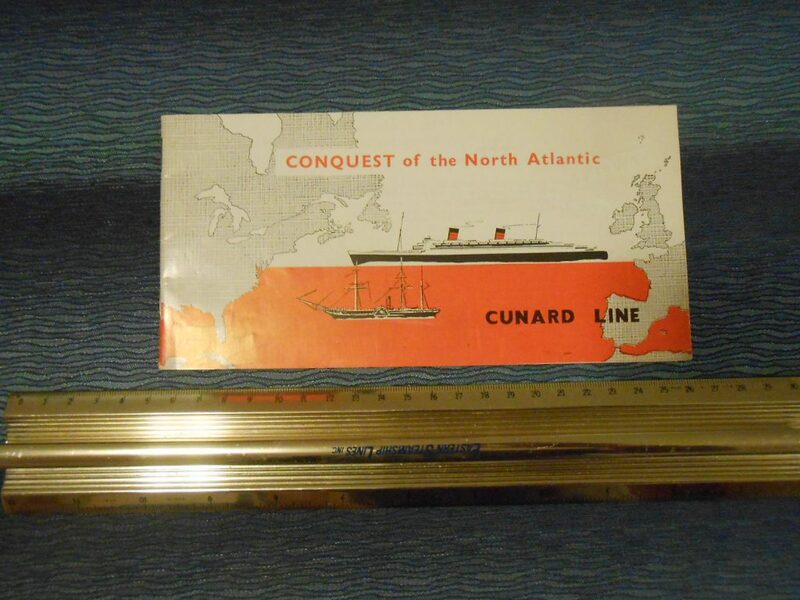 Cunard White Star: Conquest of the North Atlantic History Brochure. A wonderful little brochure that covers Cunard history and has a lot of fun “comparison“ facts about many of the old and current ships. These brochures took several different forms … this is one of my favorites graphically. 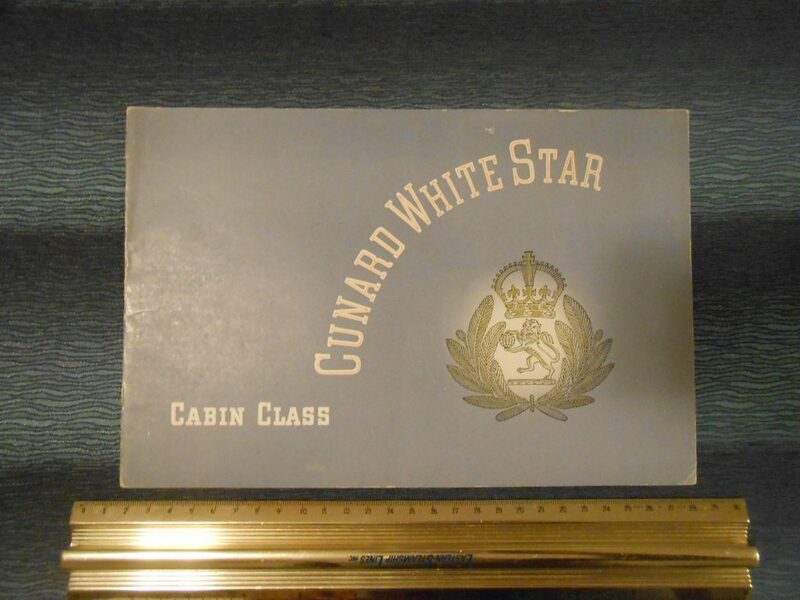 Cunard White Star: Cabin Class Brochure. 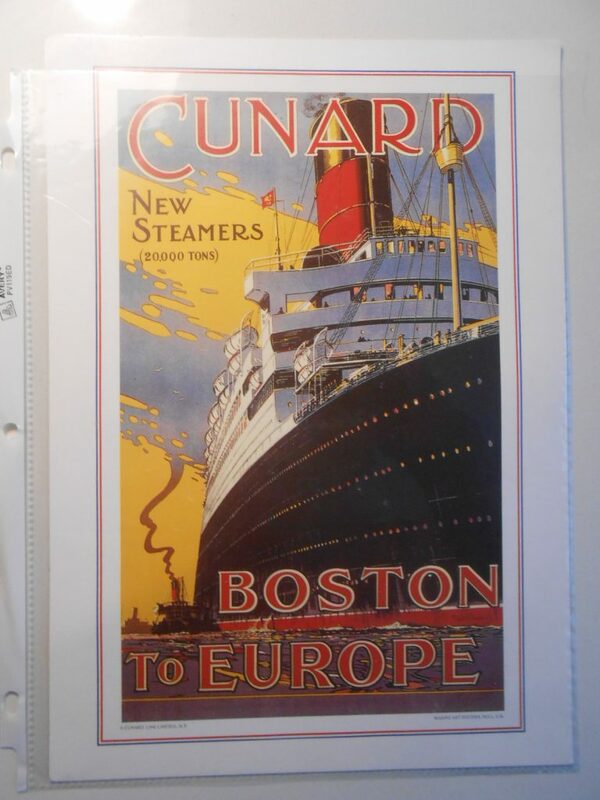 One of my favorite set of post war Cunard brochure are these that covered the different classes (First, Cabin and Tourist). 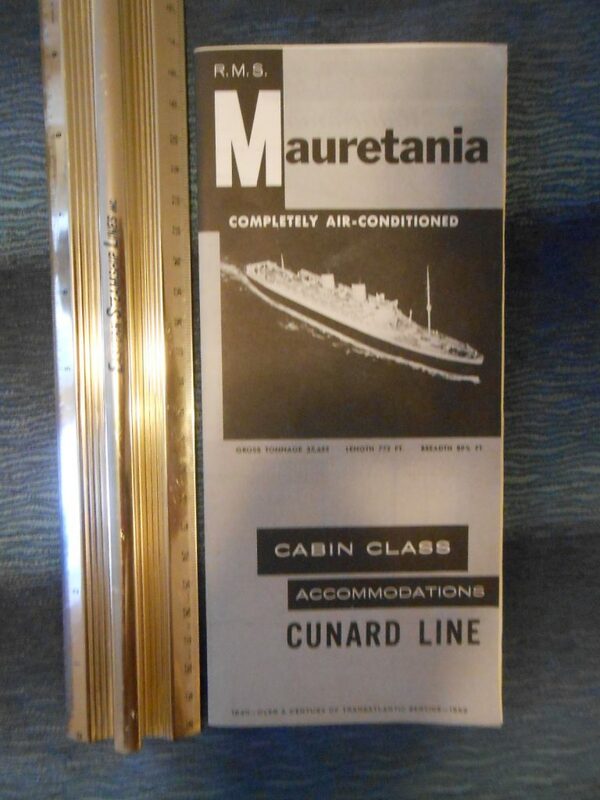 The Cabin class one here shows the wonderful interiors on the Queens, Mauretania and Caronia. I would have loved to cross on any of these ships. Excellent condition. One of my favorite images of these consorts passing in Mid Atlantic at a combined speed over 50 MPH. This print was professionally matted and reframed in the original frame at some point in the recent past. 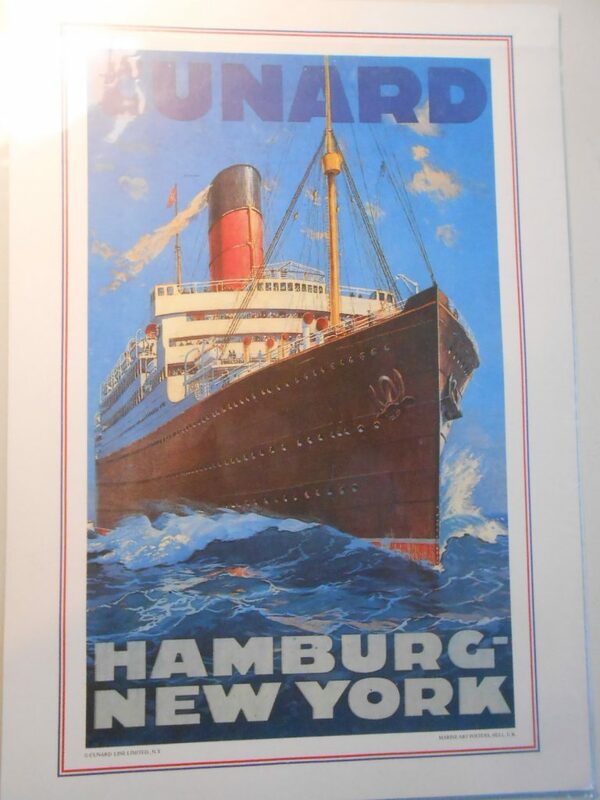 Super condition and perfect for any Cunard collection. Sorry for the reflections on the glass. 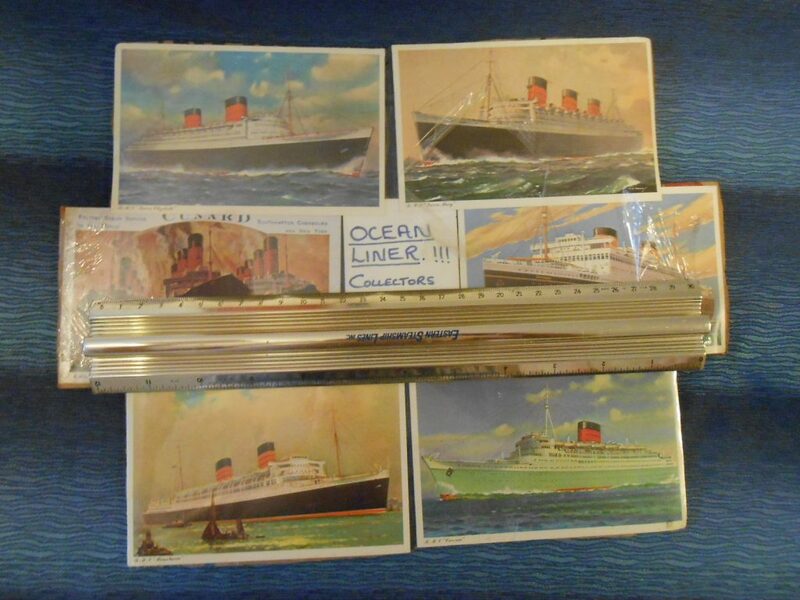 Nice set of 6 Cunard reprinted postcards …. 5 of them are the famous Turner views. The remaining one in the 1950’s is a pre WW2 card. 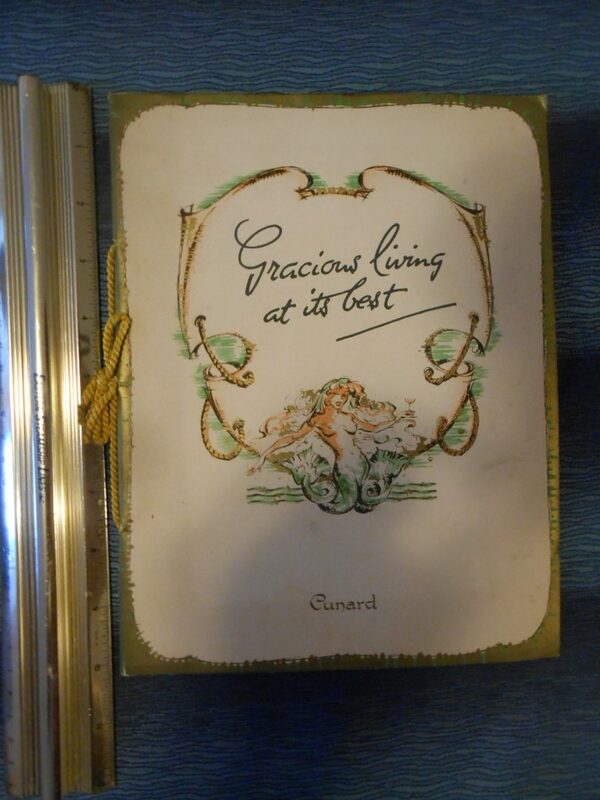 Lovely gold accented brochure with rendering of life about the Cunard liners of the 50’s. The graphics throughout are stunning and scream Mid Century design! Oh to have been onboard one of these British ladies! 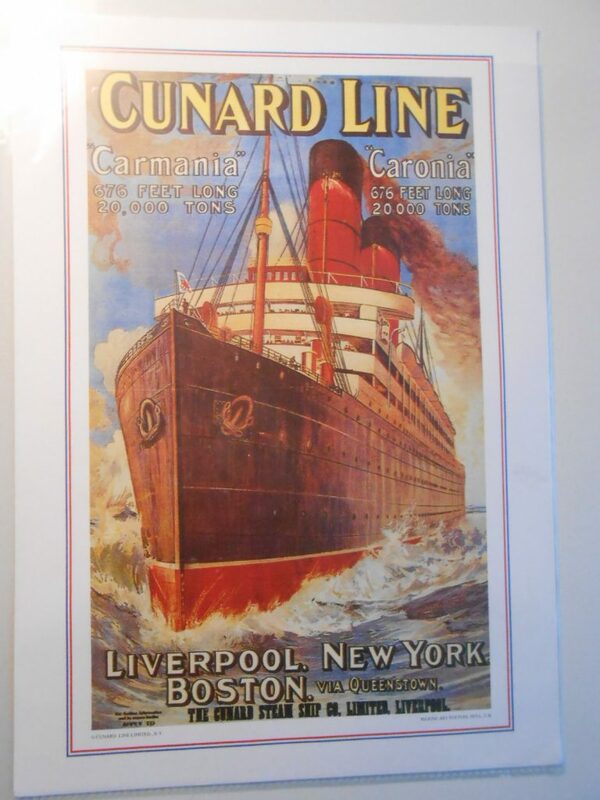 Lovely FC Brochure for the Major Cunarder’s post WW2 … covers ships like the Queens, Caronia and Mauretania. Lots of interiors pictures … all showing the use of woods from all over the empire. A vertical crease is the only detraction. 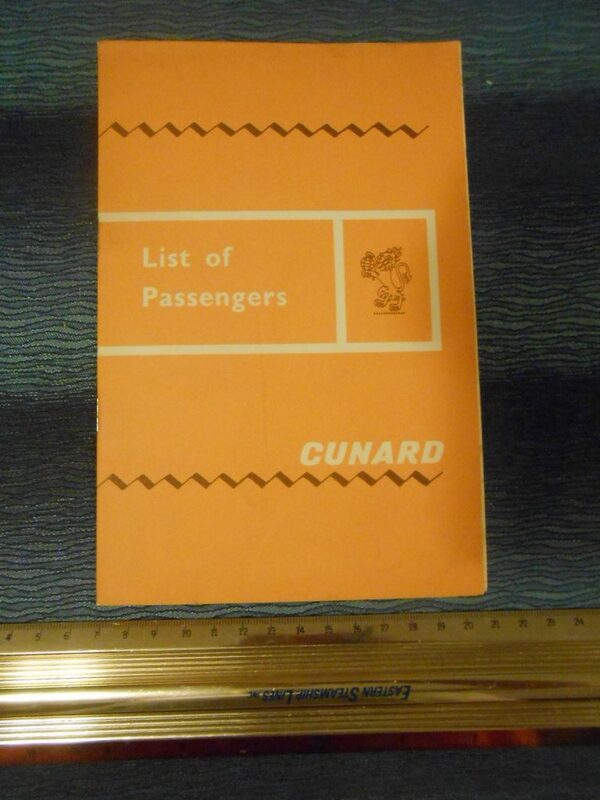 these B&W Cunard deck plans for the late50’s and early 60’s are always nice! I’m fascinated laying deckplans side by side and viewing the changes made over their refits. Great condition …like new ! 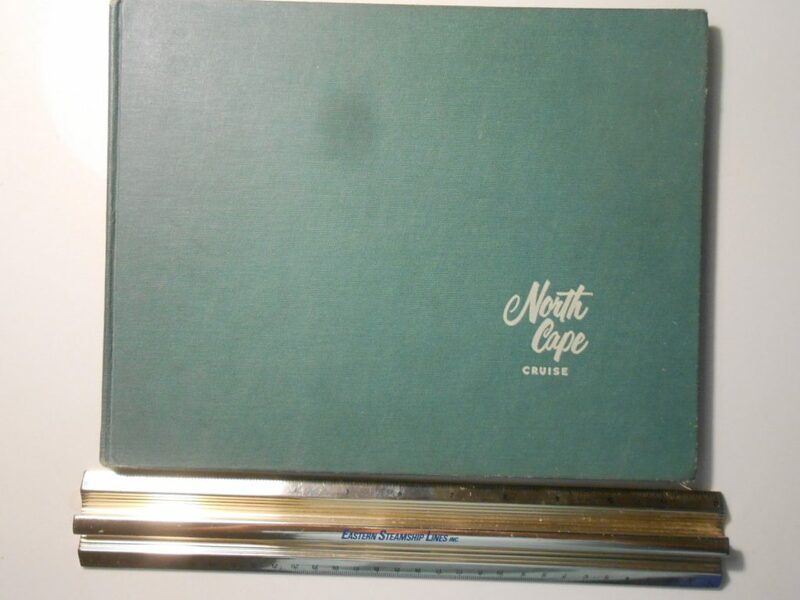 Great booklet for the 1952 North Cape Cruise with lovely line drawings by American artist John Holmgren. Hard cover and in good shape … there is a stamp on the inside for the “SS Poverty”. Approx 30 pages. 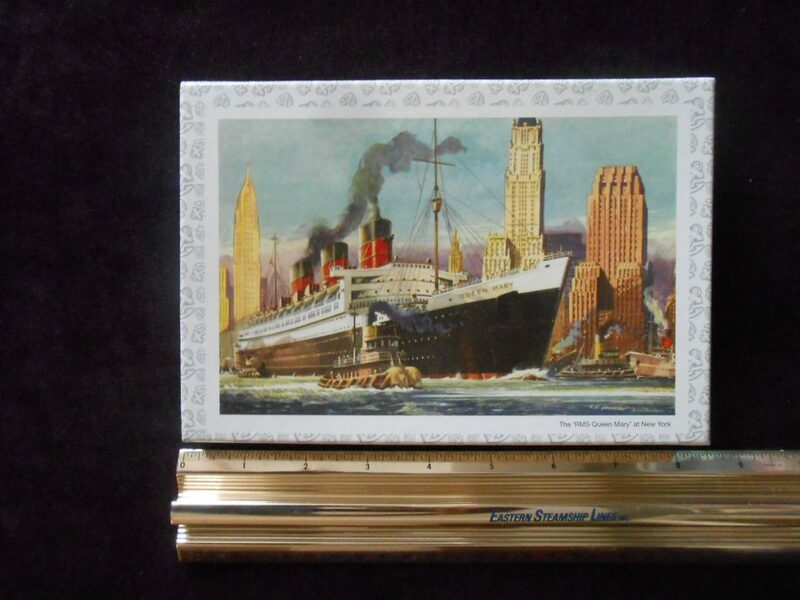 Great little puzzle for the Queen Mary … more than likely bought onboard in one of the the hotel gift shops. Excellent condition … the puzzle pieces are still sealed.